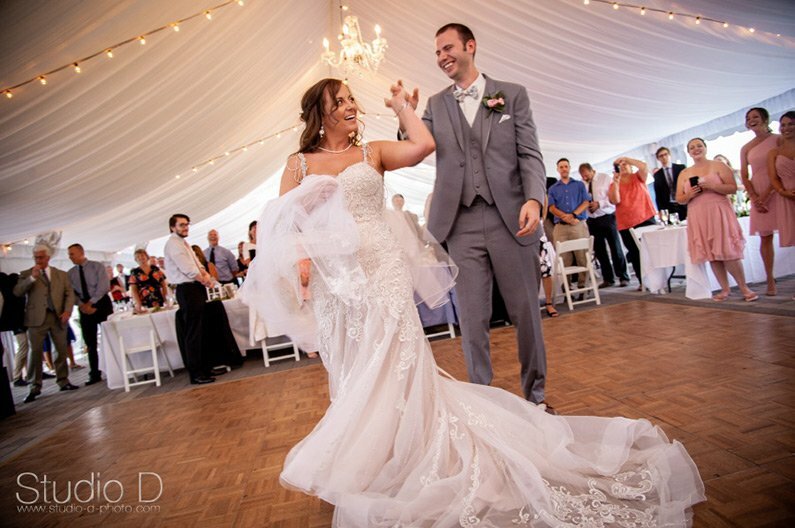 Today’s Le Bella Donna Bride is Karleigh, who married her husband Al last August in a lovely Stella York fit and flare gown with intricate lace and beading. Karleigh and Al met in 2011 at a bar. Al is very tall so Karleigh was able to spot him from across the room. She convinced a mutual friend to buy them all a drink so that she could meet Al. They began dating in June. Six years later on their anniversary, Al made dinner for Karleigh when she came home from work. Then he proposed to her and she said yes! Karleigh found her perfect gown quickly; it was the second dress she tried on! She knew it was her dress because she couldn’t stop thinking about it when she tried on different dresses. Before she started shopping, Karleigh knew that she wanted something “fitted and unique” and a low back. Karleigh’s dress was certainly unique as she added straps and altered the gown to have a lower back, altogether creating her perfect look for her wedding day! Karleigh’s favorite part about shopping for her wedding dress was having her family there with her to help her choose her dress. She also enjoyed getting to play dress up in all of the beautiful gowns she tried on. Karleigh and Al were married at Holy Family Parish in Luzerne, PA and had their reception at Huntsville Golf Club. They had a large bridal party with eight bridesmaids and eight groomsmen. They also had many guests at their wedding, 265! They had two different types of musicians: steel drums for the cocktail hour and a Bruce Springsteen tribute band for the reception. To make the day even more special, Karleigh wore the same veil as her mother. For Karleigh and Al, the best thing about their wedding was that they could finally make things official after school and work keeping them apart for so long. Karleigh’s advice to other brides is to be in the moment and not worry about things so much that you don’t get to experience how wonderful your wedding day is. Congratulations Karleigh and Al! We wish you many years of love and happiness together!